Edwin “Bud” Shrake is one of the most intriguing literary talents to emerge from Texas. He has written vividly in fiction and nonfiction about everything from the early days of the Texas Republic to the making of the atomic bomb. His real gift has been to capture the Texas Zeitgeist. 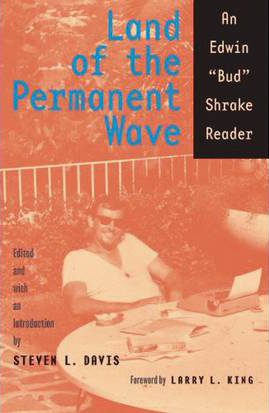 Legendary Harper’s Magazine editor Willie Morris called Shrake’s essay “Land of the Permanent Wave” one of the two best pieces Morris ever published during his tenure at the magazine. High praise, indeed, when one considers that Norman Mailer and Seymour Hersh were just two of the luminaries featured at Harper’s during Morris’s reign. This anthology is the first to present and explore Shrake’s writing completely, including his journalism, fiction, and film work, both published and previously unpublished. The collection makes innovative use of his personal papers and letters to explore the connections between his journalism and his novels, between his life and his art. An exceptional behind-the-scenes look at his life, Land of the Permanent Wave reveals and reveres the life and calling of a writer whose legacy continues to influence and engage readers and writers nearly fifty years into his career.